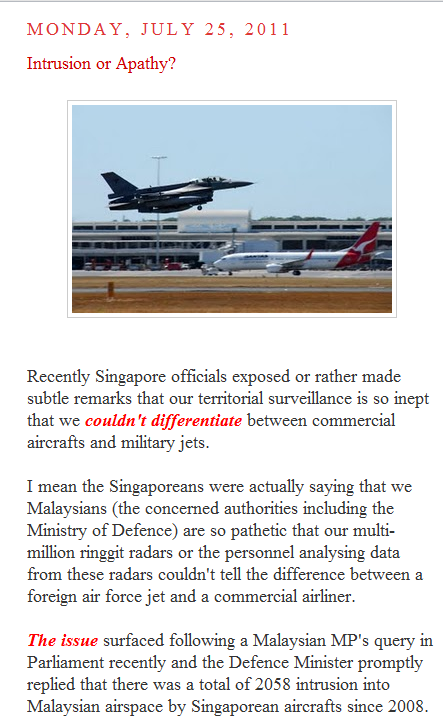 A couple of blogs my dear readers would be familiar with have been pursuing the matter with our military radars with great tenacity (see screenshots). This has not escaped the radars of the Singapore Ministry of Defence, which has contacted one of the bloggers to make some clarifications (the blogger will be publishing it on his site soon UPDATED! Click here to see letter from Mindef.). The amazing thing is, Sin's Mindef is not denying the posting. SIngapore will eat us for lunch la. All Malaysia is good at is beating up Indon maids. The film's executive producer Fred Chong also said Nasi Lemak 2.0 had the full support of the Minister from Prime Minister's office Datuk Seri Nazri Aziz who had issued an official letter endorsing it as a 1Malaysian film. and you will be the desert ??? harap zahid hamidi tidak melayan post yang sebegini .bagi saya ia hanyalah apa yang di katakan 'ESPIONAGE THROUGH THE LEGAL MEANS'. When the time comes for our submarines to leave Sepangar Bay, we realise they can't submerge. When we try to fire up our fighter jets, we realise the engines have gone missing. We try to cross the shallow peninsular rivers with our amphibous vehicles, and we find that they all take in water, and the soldiers have to abandon the vehicles. Such is the great state of our defence that the only people they can bully are those wearing yellow in their own country. Are we still flogging this deceased quadruped? I thot that your earlier topic about kiasus and alleged air space incursions had been thrashed pretty thoroughly by Skilly and yours truly? Yet here we are, propounding this guff again. To what purpose? To show up the shortcomings in our military preparedness? Khairy J did an excellent op-ed piece in the latest The Edge on this matter. Not that I agree with his thesis, but he did make some valid points! And Singapore is currently hosting a meeting of Asia Pacific Army Chiefs to discuss areas of mutual interest. A meeting where our Malaysian Army Chief or his rep is attending. oh you mean the chinese in this country are very good at beating up the indon maids? Another frustrated dimwit befuddled by the complexities of the modern world...not unlike the anti champ and the ersatz special forces wannabe. Amazing how they sprout like mushrooms after a downpour. And yet, Ahmad Zahid has gone quiet after the initial flurry of accusations. 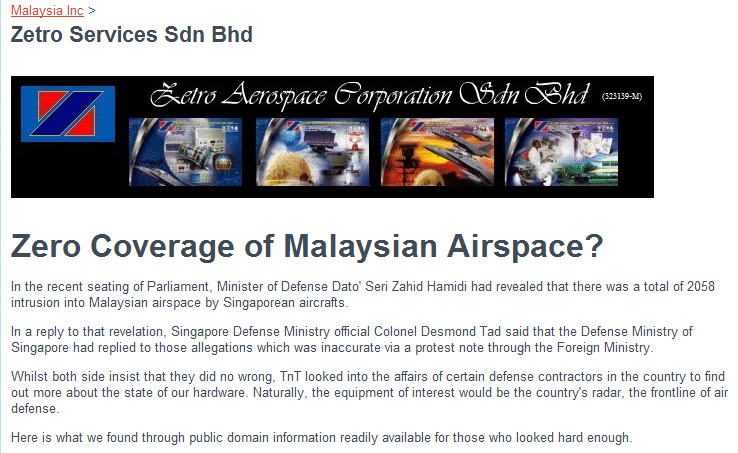 Has it anything to do with the rumours that he was poorly briefed by certain honchos in the RMAF? Or whether he has a less than complete mastery of his portfolio? Oh, by the way - is there any truth in reports that Singapore is responsible for air traffic control over the seas between peninsular Malaysia and East Malaysia under ICAO regulations?